Date of publication: November 09 2015 . Theater begins with a hanger, and it also begins your apartment. hallway - This is the face of your home, this is where the first impression of your accommodation guests. Therefore, every woman is trying to make the hall a beautiful, well-groomed and maximum functionality. Make a spacious hallway is pretty simple, but all the necessary things to fit a large family in a small room - a task already complicated. What we usually store in the hallway? Outerwear, umbrellas, gloves, hats, keys and of course the shoes - home and holiday. It is with the storage of shoes that the most problems arise. After all, we do not walk only in some sneakers, we need shoes and sandals, and all this, as a rule, is placed in a huge pile in the hallway. 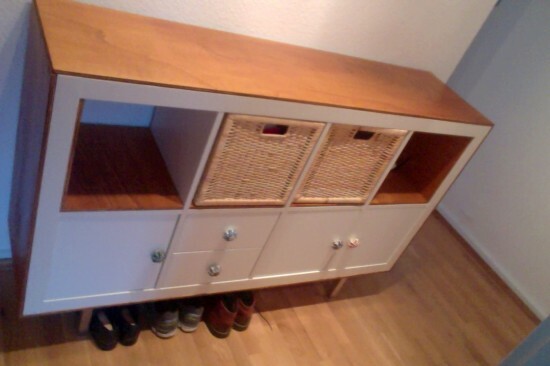 Today in our remake you will learn how you can solve the problem of storing shoes in the hallway with the help of the usual rack IKEA Kallax. - Handles for cabinets that fit the style of your hallway. Take a sheet of plywood and made her a billet, paint in the desired color. Allow to dry thoroughly all the details. With the help of liquid nails attach all the details around the perimeter shelving. 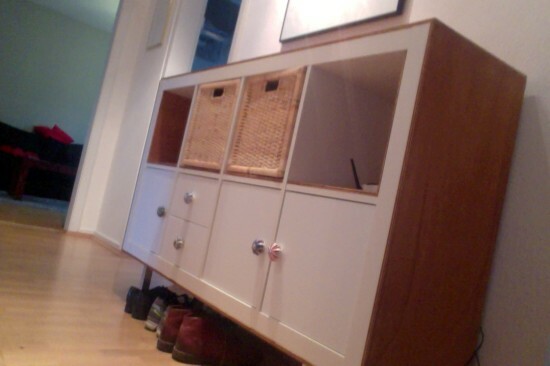 Once all is well stuck, attach the legs to the bottom of the future cabinet. 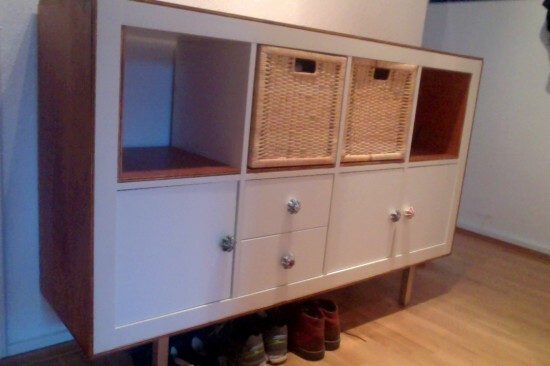 Now it remains for small, secure insert with doors and drawers the way you like best. The proposed options open top shelf, but you can and to deliver boxes with doors or tables, it will increase the capacity of the cabinet. Store shoes in the closet not only save your shoes come from the mountains, but also provide order and quick access to various details.